While we’re on the subject, your comment about me wanting to “jail the homeless” is despicable! I’ve always been supportive of groups that lend a hand to the vulnerable who seek assistance and are willing to work towards achieving self-sufficiency. Laguna has always taken care of its own. Our compassion knows no bounds! I have, however, made it clear that criminal transients who come to Laguna and commit crimes will not be supported or tolerated. I will empower the police to ticket, arrest and jail anyone who commits crimes in Laguna and in any way disrupts the quality of life that we have a right to. I know what you’re thinking, typical political rhetoric. Do you cringe at the mere mention of law and order? You accuse me of “blaming the eucalyptus trees for interfering with the views of the newly mansionized.” Actually, I blame the tree advocates that decided for us that the views of our glorious ocean became second to trees and shrubs. I believe that through proper thinning and pruning we can achieve the desired results for both sides. We have a view ordinance and it’s working. I love trees and love views of the ocean. I find most “trees over views” advocates have never had vegetation grow to a point of obscuring their beloved view of the ocean. I have. Have you? Stop monetizing the issue! Thanks for the schooling on the “Hausmannian” cottages that you deceitfully claim I intend to eliminate. I will fight to preserve historically and architecturally significant homes like the one you live in. I will also work to remove the extreme restrictions placed on the remodeling of shacks. I feel strongly that Village Laguna’s cronies at the despised Design Review Board, Planning Commission, City Hall and Heritage abuse and bully Laguna’s residents with arbitrary restrictions, behind the scenes influence peddling, and unwritten rules. I will enact term limits and will establish clear guidelines based on laws that will streamline the building process and encourage great architecture and design. These reforms will eliminate the quagmire that forces residents to squander their money on lawyers, architects and spinners who are hired in order for residents to realize their dream, a home they love and that their family can live in comfortably. Jahn, when will people like you stop relying on the past to deny us the future? You proclaim “Our unique heritage will be erased: the rooftop bars and upscale restaurants and trees chic hotels with swimming pools and double-decker multi-purpose buildings you plan to inflict on Downtown, will change and transform a unique, charming coastal town into a well marketed coastal resort.” Well, hate to break the bad news to you but all of your post Peter Blake apocalyptic predictions all currently exist and were conceived and approved while Village Laguna endorsed council members were in control. That would be Toni (20 years), Rob (4 years), and Verna (4 years). Did these projects fly under their radar? Did Ann Christoph, who attended every meeting in the history of Laguna, somehow miss the one that these existing projects were approved? Blame yourselves for mansionization, chains in the downtown and the charm you feel has been eroded. Attempts to blame me and polarize our community reveal your desperation. I live in a small apartment, drive a Prius, and run a small, highly respected gallery with two employees. I’m hardly the enabler for billionaires that you proport me to be. You denigrate the Downtown and ask “why are the residents financially responsible for recreating a Downtown to help many business owners whose merchandise is not geared towards residents’ needs.” Jahn, our Downtown is a mess and it’s because of people like you and Village Laguna. Countless restrictions have made it impossible for great businesses to open or survive. The retail mix is geared towards the lower-end tourist because that’s all our Downtown attracts. Local residents have no reason to shop Downtown. We don’t wear ten-dollar dresses, buy cheap T-shirts or tourist souvenirs. We’ve tried to enact changes in order to recreate a downtown that caters to today’s more sophisticated residents, only to be met with militant resistance. We want to close Forest Ave and create a European style walking plaza with great restaurants and great retailers geared towards providing cultural experiences. We’re tired of the tasteless frumps that inevitably dictate what opens in the Downtown. 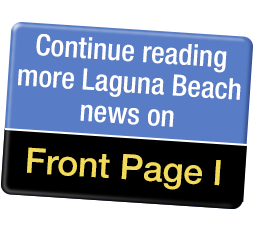 The majority of locals do not aspire to have a Downtown based on the outdated vision of the ad-hoc committee that includes longtime Village Laguna members and is spearheaded by Norm Grossman. Well Jahn, looks like you’ve exposed my true intentions to the residents of Laguna. Now, Village Laguna’s preferred candidates can win the election and save us from becoming a “Coastal resort” as your friend Toni uses as her tired campaign slogan. I’d better put on my Zegna suit on and meet with my pro-development billionaire friends. We’ll need to plan the high-rise hotels and condos for the international audience expected to attend Art Basel Laguna 2025. I’m gonna need to close some big deals in order to pay for Village Laguna’s pet projects like the taxpayer funded restoration of the sewer (Digester) or Ann Christoph and the South Laguna Civic Association’s street front lot (South Laguna Garden). We know that we can’t count on residents like yourself to pay for them. Many of Village Laguna’s past and present board members purchased their homes in the ‘70s for less than $50,000. You pay next to nothing in property tax, yet you feel compelled and entitled to dictate your agenda on the recent residents who pay the bulk of the property tax that fuels our town’s budget. It’s no wonder a million here and a million there for these absurd expenditures is not an issue for you. Jahn, I’ve been enjoying the discourse with Village Laguna’s past and present board members over the last few weeks. First it was Armando and now you. Who’s up next? I sure am looking forward to November!